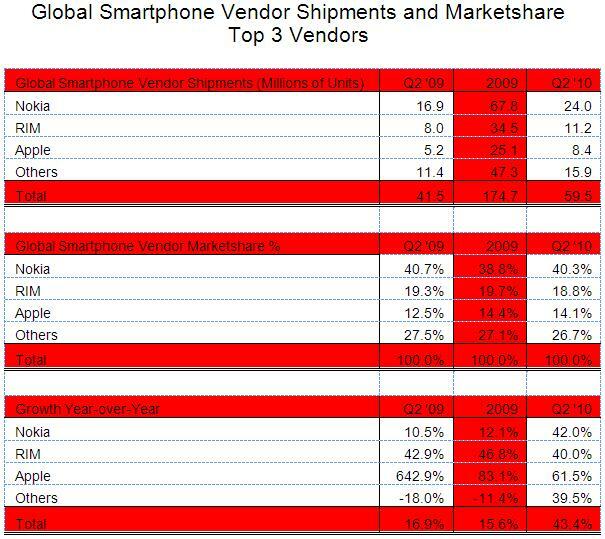 RIM Blackberry has been leading the smartphone shares in American markets and has replaced Motorola in the top 5 device makers in the world. However, if the signs are to be read well, the growth for Blackberry is tapering out. A few thoughts on the Blackberry evolution. Very clearly, while Blackberry owes its success to the corporate utilities (email); Blackberry is under some pressure to start positioning itself as a phone with more multimedia and networking versatility. Blackberry Storm I and II have not done any much in terms of extrapolating the Blackberry story and heritage to the touch space. So then, Blackberry is stuck with its QWERTY “enterprise-phone” story. Blackberry would need a big story or two to move way from what now looks like its one-trick-pony: QWERTY devices. Blackberry also faces some pressure from the security agencies globally who have repeatedly complained against the security walls of the Blackberry which can make snooping and investigation on SMSs/Mails and phone calls difficult. Many nations globally are considering blocking the Blackberry messaging services because they cannot snoop on it. So whats news @ Blackberry? Its news at Hardware and the UI/Software end of the story. Blackberry is planning to launch an attack at the Apple flagship: the iPad with its own tablet. This may be an interesting move because not only does this mark the entry of Blackberry into Tablets, it can also be argued that given Blackberry’s enterprise association, the Blackberry tablet could have more enterprise functionalities compared to the iPad. 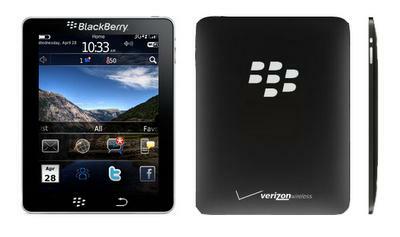 The Blackberry tablet will be called the Blackpad and will feature a 9.7-inch screen, just like the iPad. The RIM tablet will also have both Wi-Fi and Bluetooth, the later supposedly so that BlackBerry users can use their cell phone’s data connection to tether their Blackpads. The tablet will have both front and rear facing cameras for video conferencing – perhaps something that will be applied to the business marketplace for meetings. Hardware is one thing, the software OS engines are completely another. Lately the Blackberry has not been able to keep up with the pace of iOS4 and Android 2.1/2.2/3.0. Blackberry is pinning its hopes on its newest OS called Blackberry 6.0. The Blackberry 6.0 has a redone home screen, better customization control, universal search feature, pinch-to-zoom, touch screen scrolling, multi touch interface with social networking integrations. Personally I am not too sure that the Blackberry 6.0 has all it takes to get ahead, but it’s a wait and watch game. Combined with the Blackpads, the Blackberry 6.0 will have more to do: It has to take the Blackberry experience to one level higher, something that Blackberry has not done for a while. Indian Telecom Story (Part XXXII): A snapshot of the Telecom handset markets in India. Gartner projects a growth of 18.5% in telecoms penetration in India this year.Mobile handset sales will rise to 138.6 million units in 2010, up from 117 million last year and is expected to hit 206 million by 2014.India is the second largest mobile devices marjet in the world with a 636 million mobility numbers.However, established global device manufacturers are losing ground due to fierce competition from local and Chinese manufacturers in the low-cost segment. According to Gartner, Price is the main criteria for purchasing mobile device. The average selling price of a mobile phone in India is $52 (~ Rs.2400) whereas, 85% of all mobiles sold in India are below $100 (Rs.4500). These were thoughts to a few questions related to the momentum in the Indian Telecom Industrygoing forward. What are the primary demand drivers in Indian mobile handset market? 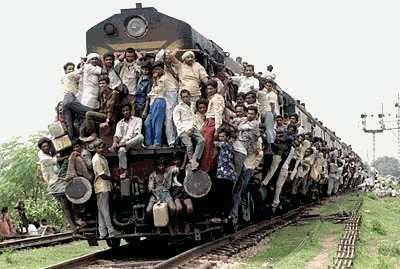 1.In the Indian context, Every 10% of additional mobility increases the GDP by 1.5%. The growth engine primarily is the socio- economic benefits of “being connected”. 3.Wider range of services are expected to power growth by bringing communication/education/utilities and information closer to the consumer. The evolving telecom eco-system will drive services story not only in high end but also in the low and entry segments. From and evolution perspective, has the Indian market reached a stage where the so-called upgrade demand is significant? With a 55% mobility footprint, “Upgrade demand” is beginning to outrace the “entry demand” of mobile handsets. To that extent upgrade demand is becoming more and more significant. Having said that the “entry demand” will still be large in absolute volume terms. From a revenue and business perspective, the upgrade demand will be more lucrative given the low profit realization from entry handsets. Among handsets, which segment (entry, mid-market or high end?) will drive growth ? There are no absolute winner segments. Each has its own value story and each is expected to grow in significant amounts over the next 5 years horizon. The entry segment represents 529 million Indians who are not connected yet. This is a bottom of the pyramid story and companies will need to be innovative and smart with their businesses to tap the entry markets. The Mid end markets have seen the purchase cycles reduce with more features/benefits available at affordable prices. A large part of the earlier consumers are beginning to upgrade and hence this segment also holds a lot of promise in future. The High end story will be propelled by Data, Services and 3G roll outs. In terms of absolute numbers, the entry and mid end are larger than the high end. 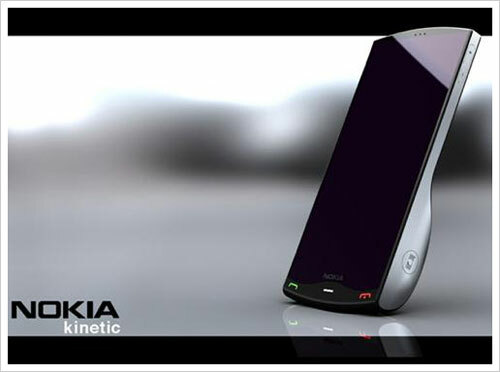 These are the pictures of the new prototype form concept, called Nokia Kinetic. 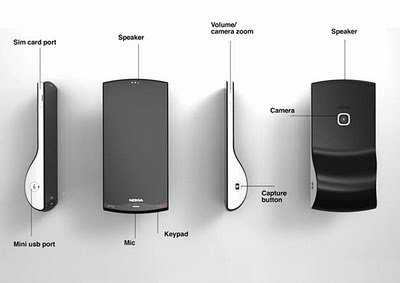 The most intriguing and interesting thing about this concept is that it includes a electro magnet which helps the phone to stand up. 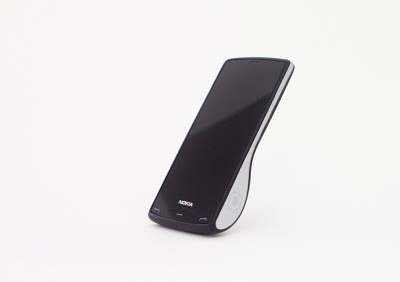 The real hook of the concept is an electromagnet which placed in the phone’s base that allows for standing up on cue by its own to prominent some specific actions and after the user’s reaction it goes back to its original position, for example if there is an incoming call on Kinetic then it will change its position vertically and if user rejects the call, then the phone will return in to stand by mode. It is be flipped down to dismiss an action like an alarm or a video calling without holding the phone. The handset has mini USB portal. It looks different from other handsets. The top half of the actual prototype is just 8mm thick, while the bottom is 18mm, and the base also conveniently doubles as a more camera-like grip for taking photos. 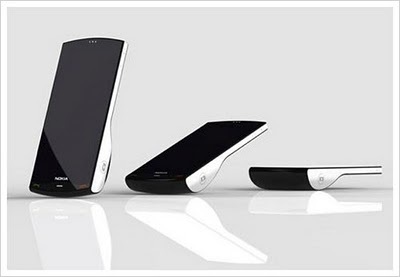 This unique concept phone converts digital information into kinetic movement. That means if the phone receives incoming call or a new text message or email on Kinetic then it will change its position vertically. If you do not want to answer, you can just tap it back off to reject the call and the phone will return to its main physical position. On the flip side, the dizzying array of smartphones and the increasingly competitive market could pose a challenge to manufacturers trying to ramp up profits. The global smartphone industry is growing volume, but the industry’s value is beginning to feel the effects of intensifying competition. Dozens of vendors from the telecoms, PC and consumer electronics industries are piling into the market and driving down prices. Even established brands such as Nokia, RIM, and Apple are finding it increasingly hard to raise prices and profits in the face of such fierce competition. Among the three major smartphone players, Nokia’s market share dipped slightly to 40.3 percent compared with 40.7 percent in 2009’s second quarter. Second-place Research in Motion saw its slice of the market fall to 18.8 percent from 19.3 percent a year-ago. And third-place Apple watched its share grow to 14.1 percent from 12.5 percent in last year’s quarter. Even while Nokia reported a 40% drop in profits in the 2nd Quarter 2010, it was able to grow its smartphone shares from 38.8% (Exit 2009) to 40.3%. 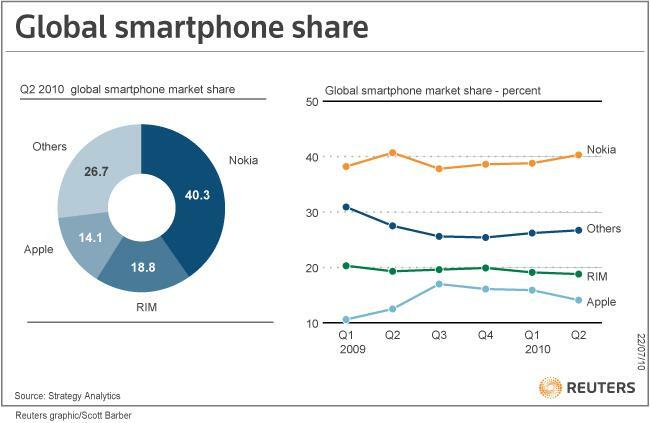 Going forward a lot of Nokia’s smartphone fortunes would depend upon the N8 and Symbian 3 Operating systems. While there have rumours of CEO Olli Pekka’s exit after a sub-optimal performance, the biggest concern for Nokia is its ASP.The average selling price for Nokia smartphones declined to €143 from €181 a year ago. Currently the 43% increase in volume has offset the 21% decrease in ASP. However going forward competition from low end Androids may result in further ASP drops unless Symbian 3 is able to reverse the perception of inability of Symbian to support Smart features. 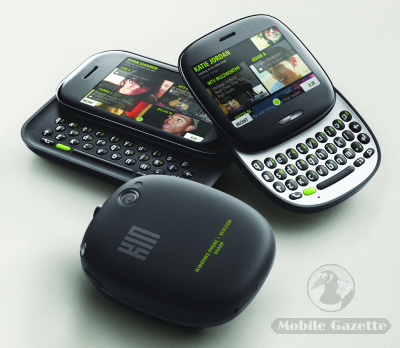 RIM may be the top gun in the North American smartphone markets, but it is also under pressure from the Android armies of HTC, Motorola and Samsung. RIM’s inability to produce a great touch experience can also be a handicap going forward. A lot depends on Blackberry OS 6.0 due launch soon. Analysts and Tech Geeks are also awaiting the rumored Blackberry Tablet. There would be lot of learnings on the Tablet front that could be taken to Blackberry’s touch portfolio. While Apple continues to beat the smartphone growth, there are some signs of the Apple sales slowing down and this is chiefly attributed to the following factors: Users were more likely to put off purchases of the iPhone in 2Q 2010 because of the anticipation of iPhone 4G. Secondly, Apple may be reaching the upper limits of the number of customers it can grab through its current carriers, especially in major iPhone markets such as the U.S., China, and Japan. To expand market share much further, Apple will need to reach out beyond its current lineup of carriers. Higher growth for Apple is expected to happen from Multiple carrier tie-ups across large markets such as US, China and Japan. The backlash of the Foxconn worker suicides and the Antennagate issue is expected to have blunted Apple’s mind share amongst it followers. Even while Facebook has crossed 500 million mark, it has lacked a consistent mechanism for turning the user/follower legions to dollars. Banner advertising in most cases doesn’t provide a worthwhile return on investment internationally. The potential implications of a virtual global currency are staggering, if not difficult to pin down precisely. Facebook users have already shown a willingness to shell out for virtual goods in online games like FarmVille and Mafia Wars. The software company behind these, Zynga, is expected to make more than $450 million this year, the bulk from virtual purchases. 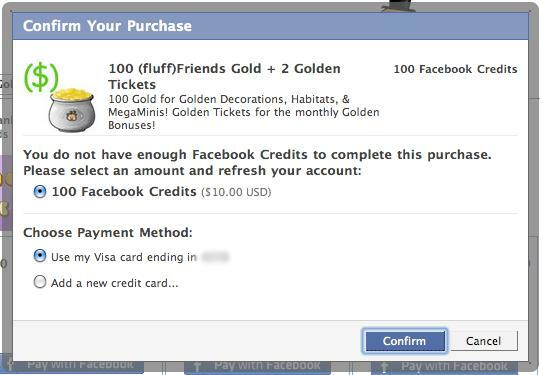 With a Facebook credits program, users both domestic and abroad may soon be purchasing real goods through companies that utilize Facebook Connect. The benefits of One-click purchasing for targeted Facebook ads could be enormous: Advertisers and social marketers might have unprecedented access to real-time data on spending patterns and international purchases. Mobile carriers stand to benefit, too, as international consumers are increasingly more adept at using smartphones for financial transactions. A virtual currency could also be a boon to entrepreneurs in developing nations. Consumers could use credits to purchase directly from artisans in Brazil or Thailand. That may require Facebook to ultimately abandon the dollar as its exchange root, but it certainly presents a unique opportunity for micropayments to blossom. There’s increasing chatter about Facebook giving Google a run for its money. But in some ways it may also carry the torch once wielded by PayPal, which held a similar vision of a truly global currency. Half a Billion! That’s the number that Facebook has released as its latest update on active users. 500 million users is not a mean achievement and Facebook is promoting the feat with its “Facebook Stories” user testimonies. Facebook started out as a networking tool for US university students. In its conquest of the global audiences Facebook adopted native language avatars and the impressive growth has continued unabated. Who will be Facebook’s next 500 million? With 500 million users, the next question for Facebook is: “What Next”? Growth in native US seems to be plateauing and the penetration across Mid East, Latin America and Europe is at percentage point 60s indicating further high growth may be difficult to come by. Facebook has a lot of room for growth in Asia pacific region which is the next focus area for Facebook growth. Then there are pockets in Europe, Lat Am and Japan-Korea which have a very high head room for supporting growth of Facebook. In all, international users comprise about 70% of Facebook’s total user base and the figure will grow exponentially with the roll outs in Asia-Pacific. There is definitely a path to a billion users for Facebook, but how long it takes will depend a great deal on its strategy to spur adoption in some of the larger, low-penetration markets. Making a push in India right now is an example of going after what is still relatively low-hanging fruit for Facebook as a large and growing market with room for continued penetration that does not have significant cultural barrier to adoption. Facebook is already engaging leading smartphone and feature-phone makers to engage mobile audiences through Facebook Connect. Facebook has a direct and a very relevant match between its service and USP and mobility. Operators would also see Facebook Connect as a means to drive up data traffic. Thus even as growth in US markets is gradually leveling out, Mobility experiences in social networking could be the growth engine of Facebook in Asia Pacific and other low penetration markets. HP LABS India has unveiled a new cloud service called ‘SiteOnMobile’ to make internet content and services available even on low-end mobile phones and reach non-tech savvy consumers.Instead of delivering a complete web page onto a mobile phone, the solution delivers only the short content relevant to the user’s task, built around HP’s patent-pending technology — TaskLets. The new solution, which is operator-independent, enables portal owners to design mobile applications and extend reach from 60 million internet users to more than 600 million mobile phone users. Antennagate: Thats what the folks at Apple termed the failure Antenna glitch in their iPhone 4G which is now assuming the status of a colossal mistake. Steve Jobs and his team have come clean on the mistake and are working double time to provide solutions to the Antennagate. A few analysts are of the view that Apple should pull the plugs on iPhone 4G, which to me looks to be an over reaction and a less prudent move.However it does put a half stop to the Apple Juggernaut which was rolling full steam. That to me is not the biggest of Apple’s worries. To me its the rapidly maturing Android platform, that has the greatest potential to give Apple and Steve Jobs a headache. While Android is still a few blocks behind iOS4, Google has been accelerating fast and sure to catch up with the iPhone OS. The Android 2.2 Froyo will almost level the playing filed with iOS4 on the smartphone space. The Gingerbread edition of Android is expected to level the differences with iOS on the Tablet space. 4. Better Service rates through the Tethering feature. Cost differentiation for high speed internet tariffs. 5. An Android market which keeps getting better. Closing the gap with iOS4. 6. Getting better on the browser and leaving iOS behind. It is time for Apple to be concerned about Android, its chief competitor. The Froyo release will be the most significant Android release as it delivers functionality which could rival Apple’s iOS4. 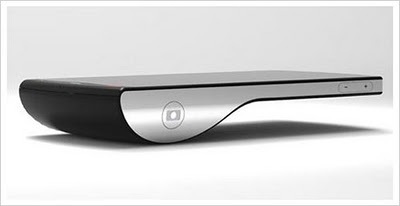 The real battle between Android and iOS has now begun and the Antenagate has already ruined iPhone 4’s debut. Google has been steam rolling the telecommunications industry and been re-defining a ground rules in its own manner upsetting the traditional business models. Discontinuous innovation, keen understanding of the consumer, great portfolio of products and investments into the future are a few factors that have been shaping the Google juggernaut. The following presentation is about the threats from Google and how Telecom players need to cope, complement, collaborate and finally use this juggernaut to fashion their growths. The Kin as a product was also a victim of muted interest in the Microsoft services platform. Windows Live, Bing and Zune are major Microsoft service elements which however have not been able to entice the American audiences. This actually underlines an ongoing problem for Microsoft in its efforts to use its services to drive adoption of its mobile platforms and vice versa. This would be a problem that would continually haunt WinMo and as per early indications, the Windows Phone 7 may also be limited to its “island” of Microsoft approved services. However, what looks like the biggest factor in Kin’s failure was possibly Verizon’s service pricing. Bothe devices came with two year contracts with a minimum monthly voice tariff of $40 and data tariff of $30. This meant that despite Microsoft’s intention to position Kin below Windows 7 and other high end devices, the Kin One and Two were competing with devices such as iPhone in terms of monthly service cost. Interestingly Kin’s most innovative and differentiated aspect: The Kin Studio which was a digital diary and content aggregation point from which users could populate other services. The drawback of this service was that it needed to constantly synch data with cloud based servers and thus Verizon wireless had very limited flexibility when pricing its data tariff. So while Microsoft correctly identified an opportunity for an inherent social networking experience, it failed to recognize that a cloud based push infrastructure would lead to exorbitant service prices that took the product out of the reach of its target audience. The termination of Kin could also have been a fall out of regime change within Microsoft. The technology team backing Kin departed a few weeks after its launch and there apparently were no backers. Also Microsoft is possibly trying not to de-focus from its Windows Phone 7 given its strategic criticality. The decision to close down Kin while hasty and premature could still yield some results for Microsoft in terms of borrowing Kin’s associated infrastructure and merging Kin’s elements into Windows 7 from the start. 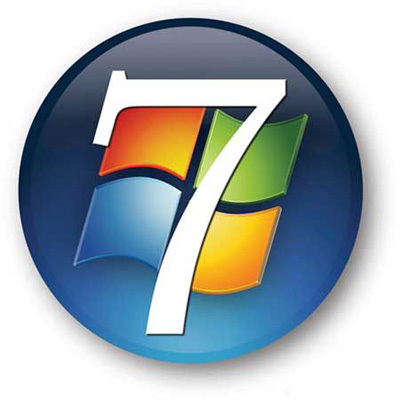 With the failure of Kin, the pressure builds on Microsoft to ensure the 100% successful delivery of Windows 7. Guardian's Open Platform (Part 2): Where's the money?